Welcome to my new website. Well I have been busy discovering new ways to express myself in my paintings; my husband has given my website a fresh new look. I hope you enjoy it. I was fortunate to be able to attend a workshop with Mike Svob last summer. Mike’s paintings are full of surprising colour. Being a colour junkie myself, I was looking for inspiration and different ways to use glazes. What I came away with was a style Mike called “Black Elvis Textured Painting” where you cover the canvas with textured black gesso and paint large shapes with pure acrylic paint leaving a black outline. It was very different than anything I had done before and I loved it. 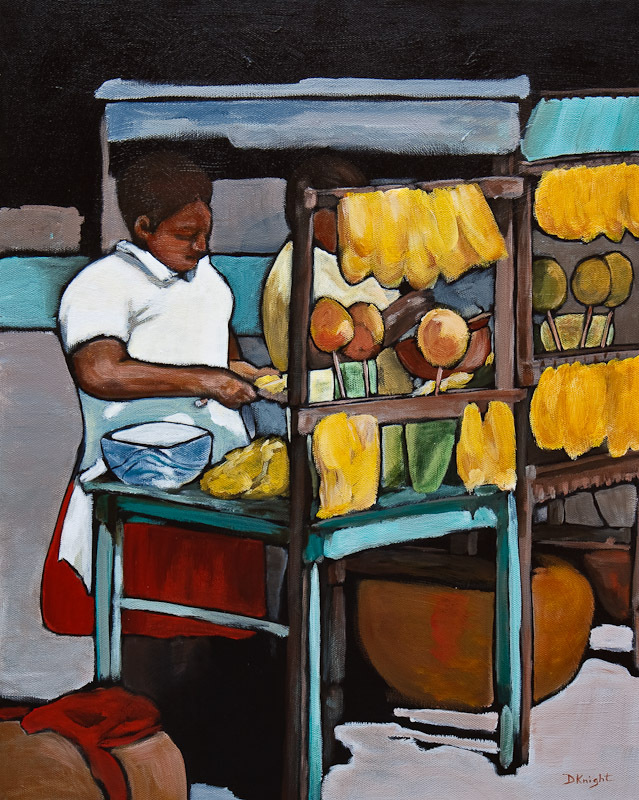 I have attached a painting titled “Mango Stand” using this method. I also attended a demo at Painters at Painters Lodge in Campbell River given by Grant Leier and Nixie Baron. They both use collage and different tools to make patterns and shapes. Nixie does this with encaustic. Very playful stuff. I’ve decided I’m going to spend my summer playing so it will be fun to work with other tools besides paint, brushes and palette knives. I have taken on the position of Chairperson of Artists of Todos Santos for the 2010/2011 season and passed on the organization and running of our Annual Artist Studio Tour. Visit www.artistsoftodossantos.com to see how our group has impacted visual arts in Todos Santos, our small Pueblo Magico in the Baja. With this big responsibility with ARTS, I think ‘playing’ with my art will offer a nice balance. It will be fun to see what directions that takes me. I love this new painting. Good work Diane!